Mumbai : Big FM, one of India’s largest radio networks, recently concluded ‘Big Khushiyon Ka Safar’ – a festive contest held in Lucknow on a very successful note. With an aim to brighten the festive mood this Diwali, the radio station led a month-long on-air contest which commenced on 4th October motivating listeners to participate and stand a chance to win the Bumper prize. 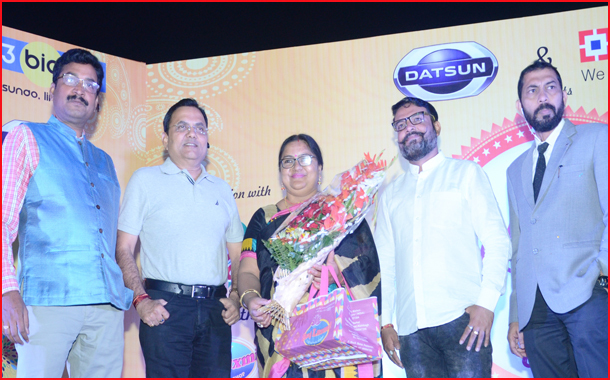 The grand finale took place in One Awadh Mall, Lucknow, amidst much fanfare where winner Geetali Pandey walked away with a brand-new Datsun Redi GO Car. The radio network received over 4 lakhs missed calls From people to participate in the biggest contest held in the‘City of Nawabs’ through which the first 50 finalists were chosen.In the second segment of the contest, 50 finalists were also selected From the ones who visited the radio network’s partner outlets and submitted their form in a drop box. As a part of the campaign, BIG FM also integrated ‘Lucknow Ka Kona Kona’ through an extensive on-air as well as on-ground activity supported massively by the digital and the print medium. Known for spawning fresh and innovative campaigns time and again, the radio network, with its sustained efforts, has expanded the horizons of radio entertainment and will continue creating enriching experiences for its listeners.‘BIG Khushiyon Ka Safar’ was partnered by renowned brands namely Datsun, HDFC Bank, Goliori Pan Shop, Amar Ujala, One Awadh Mall and Rajluxmi Sweets.